If you’ve been looking to use Live with technologies like Arduino, LEGO® MINDSTORMS® EV3 and OSC, this free set of Max for Live devices provides exactly what you need. Now it’s simpler than ever to set up new and experimental ways to interact with and extend Live. These devices allow you to connect, control and monitor Live with a range of innovative technologies and communication protocols. Use LEGO® MINDSTORMS® EV3, Arduino, or littleBits™ to connect up sensors, lights or motors, open your sound world up to the web through JSON-based APIs, or convert OSC data to MIDI data. The list of input and output possibilities for music & sound creation with Live is almost endless. The Pack consists of 11 Max for Live devices: a toolkit for exploration, or to open up in Max and adapt to your own needs (Max programming knowledge is required for this!). Some devices demonstrate how you can use each protocol to capture different types of data. You can get the pack using the download button to the right or by forking our repository on GitHub. Here’s more on how you can use each device. LEGO® MINDSTORMS® EV3 – Connect an EV3 Programmable Brick to Live and get access to its sensors and motors. Arduino - Connects switches, potentiometers and other sensors to control Live parameters, or use Live to control LEDs or Servos connected to an Arduino Uno. Camera – fetches webcam data in order to control mappable parameters. 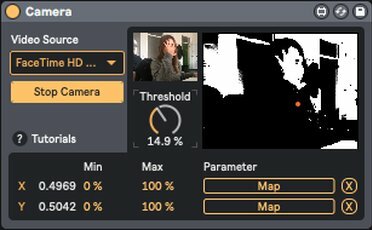 OSC Send – converts any mappable Live parameter to OSC data for sending out of Live. OSC TouchOSC – allows you to map any controller from any available TouchOSC layout to live elements. 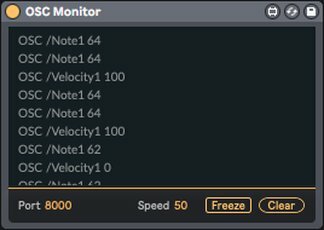 OSC Monitor – a simple but useful OSC data monitor. 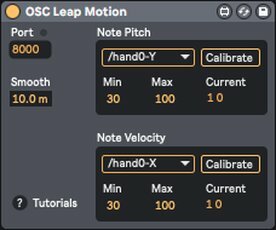 OSC Leap Motion – uses Leap Motion to generate midi notes with the help of the ManosOsc application. OSC MIDI Send – sends MIDI note and velocity data as OSC messages to a Processing sketch. JSON Weather – one of two examples on how to fetch JSON data from the internet, parse it through dictionaries and query specific data content from it. 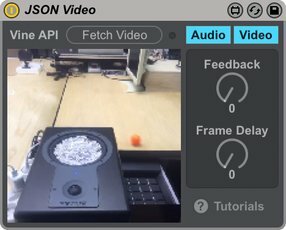 JSON Video – the second example device on how to fetch web data in JSON format: uses #ableton tagged looped videos from the online video sharing service “Vine”. Mix or mutate between four independent sound sources using a flexible morph matrix and a Push-ready modulation sequencer – Hypermorph offers a playful way to create rapidly changing or evolving sounds.